9 January 2019 – Sarafina is the latest release from the breeding program of Advanced Berry Breeding. The variety appears to be an excellent addition to the previously introduced varieties Wengi, Shani and Rafiki. This has been confirmed by the extensive trials that have been conducted in Spain, Tanzania and Mexico and other countries. 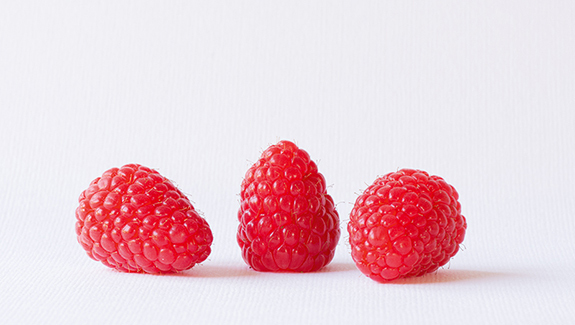 Sarafina, previously known as ABB 120, produces large raspberries with a bright, orange-red raspberry colour. They have a good taste, are firm and also remarkably easy to pick. In addition, they have an excellent shelf life and are easy to transport. Also during storage the fruit retain their light colour. The plants have a lot of vigour and are easy to grow. Sarafina is not only suitable for cultivation in moderate climates but also tolerates high temperatures. Therefore, the variety is also suitable for cultivation in Mediterranean and tropical dry growing areas. January 2019 – Advanced Berry Breeding B.V. has started a new sister organization: Advanced Plants B.V.. Together with five plant propagators this new venture is going to produce raspberry plants. Advanced Plants has the role of coordinator and communications desk. The reason for this new organization is the increasing demand for plants of the Advanced Berry Breeding varieties. The five connected propagators will take care of the production of mother plants and fresh plug plants of all existing and new varieties of Advanced Berry Breeding. Together they will be able to increase the availability of healthy high-quality plants combined with a timely delivery. At Advanced Plants a permanent team will be responsible for a clear and regular communication to the customers. Advanced Berry Breeding and Advanced Plants expect a successful collaboration with all customers. For more information please visit the website of Advanced Plants at www.advancedplants.nl. 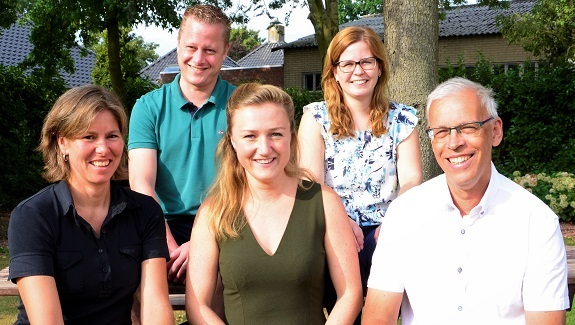 August 2018 – Since the beginning of this year, Advanced Berry Breeding (ABB) has entered into its new office in Hedel, the Netherlands, and is at full strength with a few new colleagues. The office of ABB is led by managing director Wim Aalbersberg and financial manager Colinda van Beurden since 2017. From the beginning of this year, Sjoerd van Gestel has joined them as account manager. Subsequently, Ayla Voets and Heleen de Jong completed the team. They are dealing with license management, office management and marketing. The successful raspberry varieties Kweli®, Kwanza®, Imara® and Mapema® are already on the international market for a number of years. From the 1st of July 2017, ABB takes care of the licensing itself. At the end of 2017, a serie of new varieties was launched: Jambo®, Shani, Rafiki and Wengi. Each variety has particular characteristics. You can find more information about these varieties on our website. In 2018, ABB is moving forward at full power and steps into a new phase. With our research partners and cooperating plant propagators and fruit growers, ABB is running tests for new selections. We expect to bring new and exciting varieties of soft fruit to the market in 2019 or 2020. The trials in The Netherlands, Portugal and Tanzania are promising and encouraging. Furthermore, ABB will step into new markets on the various continents. With the new team, the knowledge and experience that ABB has, we expect great developments for the future. Would you like to know more about the varieties of ABB and the development of ABB? Follow us on LinkedIn and visit the website www.abbreeding.nl Please feel free to contact us by e-mail at info@abbreeding.nl We are happy to make an appointment with you. Photo caption: above Sjoerd and Colinda, below Heleen, Ayla and Wim. January 4th 2018 – Advanced Berry Breeding released four new primocane raspberry varieties end of 2017. These new varieties are a great addition to those that have been introduced previously, like the successful Kweli® and Kwanza®. 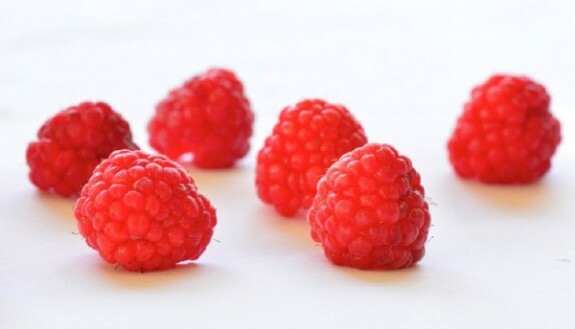 Wengi produces an enormous yield of raspberries with a beautiful bright colour. The berries have a good shelf life and their quality remains well after transport. Wengi appears to be particular suitable for areas with a moderate or a Mediterranean climate. Shani starts production very early. Even in low-light conditions this variety continues to produce flowers and raspberries. This makes it primarily suitable for winter crops in Mediterranean climates. Shani produces beautiful raspberries and has a high yield. Rafiki is a variety with good application in many growing areas. This variety is spine-free in most cases, easy to grow and gives a very high yield. 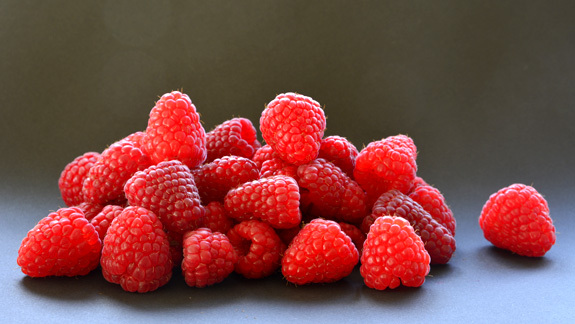 Moreover the raspberries have an excellent shelf life which enables transport over long distances. These characteristics combined make Rafiki every grower’s friend. Jambo® produces firm fruit with a remarkable yellow colour. Even days after harvesting this colour is maintained. The variety is easy to grow and high-yielding. Jambo® is attractive to markets looking for fruit with a different, unique appearance. Limited plant material of these varieties will be available in 2018. May 1st 2017 – The collaboration between Advanced Berry Breeding (ABB) and Meiosis Ltd. for the ABB raspberry varieties has ended as from 30 June 2017. The existing licenses for Kweli®, Kwanza®, Mapema® and Imara® are being handled by ABB itself from that date. ABB will replace them with new licenses in due course. 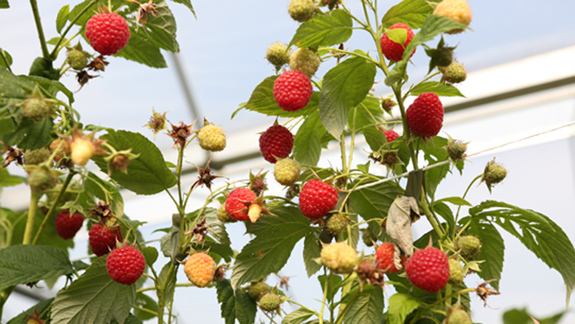 ABB itself will be in charge for all licensing of its existing and new raspberry varieties. Inquiries for information about the existing and new licenses for the ABB varieties can be addressed to ABB: info@abbreeding.nl. January 3rd 2017 – Some of the newly bred primocane raspberry selections are showing excellent results in the trials. They appear to be well adapted to warmer climates, like in Southern Europe. As an effect, Onubafruit in Spain has showed some interest in an exclusive license for two of them: ABB 117 and ABB 121. ABB 117 is an early variety that gives an extremely high production. The production is clearly higher than that of Kweli of Imara. The raspberries have a long shelf life and are suitable for long transport as well. ABB 117 bears high temperatures well and is very easy to grow. ABB 121 is an early variety too. This variety is giving great results when used for cropping in the winter period. The plants do not stop growing and/or flowering when the day length is short and the light intensity is low. The quality of the fruit is very good during this period. ABB 121 is a step forward in producing raspberries in the first month of a year. For a number of other new selections the tests will continue, often in collaboration with partners in several countries. March 25th 2016 – During the Rubus and Ribes symposium held in 2015, Christoph Carlen of the Swiss institute Agroscope presented the results of a variety test with new primo cane raspberry varieties. The goal was among others to find primocane varieties with high contents of bioactive compounds, like vitamin C, phenols, anthocyanins and antioxidants. The reason for it is the increasing interest in the health promoting effect of fruit. In 2012 and 2014 respectively 12 and 8 varieties were evaluated, among them the varieties of Advanced Berry Breeding Kwanza®, Kweli® and Imara®. From the results it appeared Kweli® was doing very well. Kweli® not only showed the highest yield, but also the contents of bioactive compounds appeared to be very high. 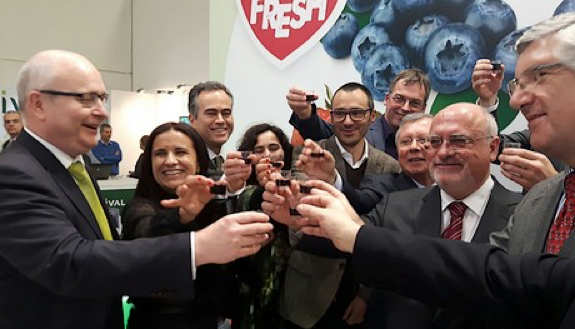 March 25th 2016 – On 4 February 2016 Special Fruit N.V. from Belgium and Bfruit from Portugal announced their strategic alliance with regard to the production and marketing of Kweli® and Kwanza® raspberries. The agreement was signed at the Fruit Logistica in Berlin, in the presence of the Portuguese minister of Agriculture, Forestry, and Rural Development, Luis Capoulas Santos. Through this strategic alliance both partners strengthen their competitive position in the challenging European soft fruit sector. Both companies will collaborate through their Portuguese company Multiberry, which concluded to an alliance with Advanced Berry Breeding earlier. Bfruit currently unites more than 120 Portuguese soft fruit and kiwi producers and will be able through this agreement to strongly expand its growers base and export volumes. Moreover it will provide its members access to new soft fruit varieties and enhanced technical support. Special Fruit will gain access to large, year round volumes of the highly popular raspberry varieties Kwanza® and Kweli® and will provide Bfruit access to new export markets for its other products. Production and sales of Kwanza® fruit throughout the year belongs to the possibilities then. 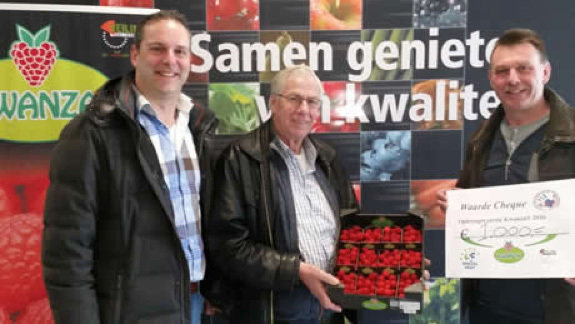 March 2nd 2016 – On Wednesday 2 March 2016, six weeks earlier than in 2015, the first Kwanza® raspberries were put up for sale at the auction in Zaltbommel. These raspberries were produced by Zachtfruitkwekerij Simons B.V.. Special Fruit N.V. in Mheer, Belgium bought the raspberries for the price of Euro 71,- per box of 150 gram through broker H. Aarts. This opened the raspberry season in the Netherlands, which will continue until Christmas 2016. The auction in Zaltbommel completed the money to the amount of Euro 1,000 which was donated to the foundation KiKa. KiKa has the goal to have a 95% recovery for children with cancer by 2025.